It turns out that picking "the one" to vote on proved more daunting a task than coming up with "the six" needed for the contest itself. That means visions of legumes and their use yet dance in my head - expect to see more recipes in future posts, heh heh. So, just as I had a time deciding between which recipes made up the "six", I struggled with which of the six to select as "the one" (selection for the contest). I loved the complex taste of the first two (lentils made risotto style and the lentil olive salad) along with the ease of preparation. I drooled over the thought of chowing down on the enchiladas and the rangoons. Yet the marriage of textures and flavors in the spring rolls along with the fun of sprouting lentils caused me to lean to this being the pièce de résistance. In addition to the fun ways the legumes were used was the ease with which they would be added to any party menu. Yet, as I mused over this and that with the five, I kept coming back to the ease, the taste, the texture and multi-use nature of "the one" - the roasted garlic and lentil bechamel. In my post, it was used as a sauce for fettuccine paired with roasted tomatoes - a sensational taste and texture combination - and also a sauce for poached eggs. Upon weighing whether to use the sauce I created kept popping up. For instance, it could be the base for an enchilada sauce - red or green; change the herbs and it becomes a new taste sensation altogether; add cheese and use it for an alfredo topping on pizza, or mixed with pasta and baked for macaroni and cheese. So given the simplicity of the basic recipe and, by its very nature, the variations an inventive mind can create (I know many of you probably have thought of a few), I decided it would be "the one" showcased for the contest. 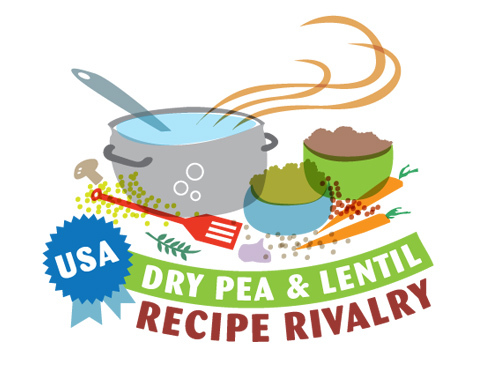 So win, lose, or draw I hope I have helped broadened the way lentils will grace the tables of whoever happens upon this blog. Please pass the link to voting along to your friends and family, and ask them to vote, too (every day!). Every vote counts, and I need your help! oh man, bummed i missed the contest! ah well, some great recipes to try :) and time to vote!